The Mushroom Marauder and Jake "The Crusher" Fungi are two large Mushroom men who are professional wrestlers, and are Toad's cousins. The Mushroom Marauder and Jake appear only in The Adventures of Super Mario Bros. 3 episode "Tag Team Trouble". Because he has fallen asleep, Toad fears that Bowser has stolen a one-million Gold Coin donation from him, which actually has went to the Mushroom Kingdom Orphanage. 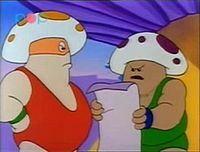 In an attempt to earn back the money, Toad sees his cousins who agree to enter the Tag Team Wrestling Tournament to win him the prize money. When Toad is signing up his cousins, Bowser and Cheatsy are also there to sign up the Sledge Brothers. Although the Sledge Brothers knock Toad and his cousins around initially, the Mushroom Marauder and Jake roll into the Sledge Brothers, giving Bowser the impression that his team is going to lose. Not wanting to disappoint Bowser, Cheatsy sneaks into the Mushroom Castle where The Mushroom Marauder and Jake are sleeping, puts them under hypnosis, and orders them to remain asleep for two whole days. Toad tries everything to wake them up, but he is unsuccessful. However, Mario and Luigi agree to enter the match for Toad in place of his cousins. This page was last edited on February 26, 2018, at 21:37.